When a meeting request is received in your email program, and the request contains an iCalendar (ics) attachment, open the attachment in VueMinder. This can usually be accomplished by double-clicking the attachment. You can also save the attachment to your computer and then drag-and-drop it into the VueMinder window. VueMinder can process meeting requests. These meeting requests can originate from other users of VueMinder, which provides a "New Meeting Request" command on the File menu. The request can also originate from another other calendar software that uses the iCalendar file standard for meeting requests (note, this does not include Microsoft Outlook). When a meeting request email is received containing an iCalendar (ics) attachment, open the attachment in VueMinder. Depending on your email program, this can usually be accomplished by double-clicking the attachment. The meeting will be automatically added to your calendar and a Meeting Response window shown. On the Meeting Response window, you can choose to accept, tentatively accept, or decline the invitation. You can also choose whether to send the response to the meeting organizer. If you decline the meeting, it will be removed from your calendar. Buttons at the lower-right corner of the window enable the meeting request to be accepted or declined. An email will be sent to the meeting organizer with your response. Note, this requires your email settings to be specified. If you haven't entered your email settings, no response will be sent. If you've entered your email settings but prefer to not send a response to the meeting organizer, uncheck the "Send a response" box prior to clicking one of the response buttons. The organizer name or email address will be shown at the top of the window as a link, along with any other recipients of the meeting request. You can click any of these links to initiate a new email using your default email program. For example, if you're declining the meeting invitation and would like to provide the organizer a reason, you could click the organizer's name to send an email explaining the situation. The meeting details will be shown in the middle of the window. This includes the meeting title, location, calendar, category, priority, date/time, duration, and description. The description can include pictures or links if VueMinder was used to generate the meeting request (pictures need to be located on the web or a common server in order to be visible). The meeting can be opened in the Event Editor by clicking its title link. This will enable you to enter additional information about the meeting or define reminders. In addition, when hovering the mouse over the meeting details, buttons will appear at the bottom. 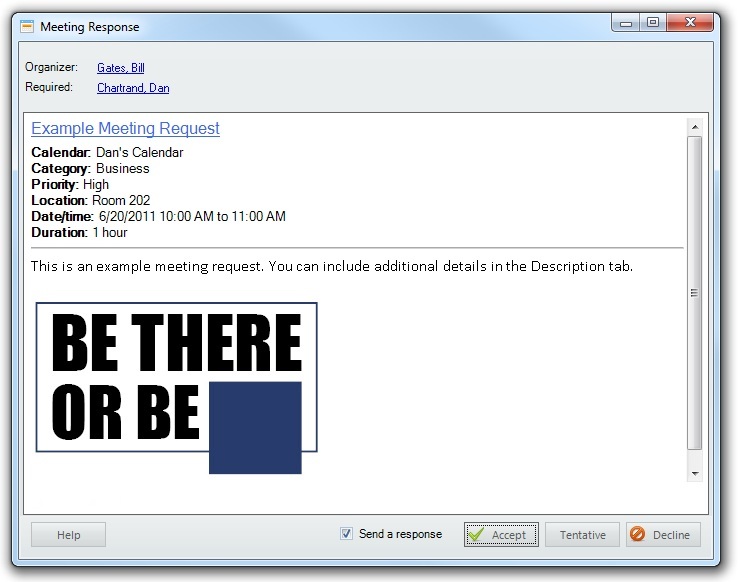 These buttons enable the meeting details to be printed, copied to the Windows clipboard, or emailed.